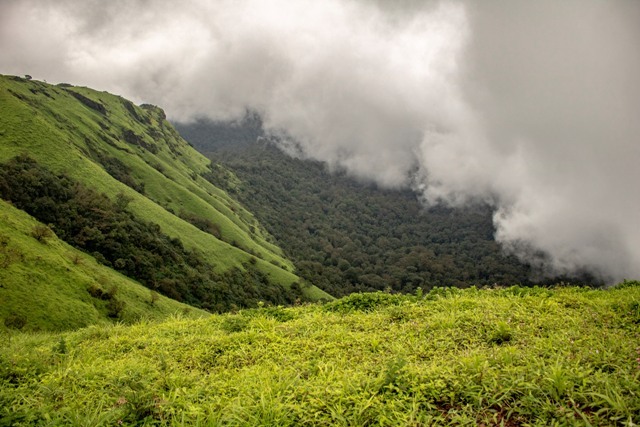 Located in the scenic western ghats, Kodachadri (1343m) in Shimoga is one of the better known trekking destinations in Karnataka. 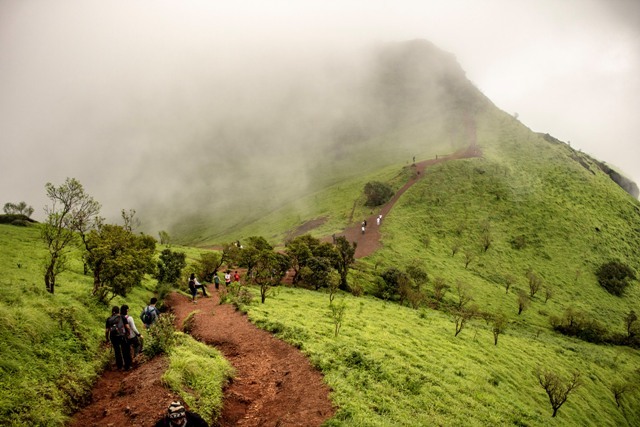 We start from Bangalore on Friday night and reach Kattinahole, at the base of Kodachadri between 5 and 6 AM on saturday morning. At about 8 AM after freshening up, and a quick breakfast at our homestay, we will proceed to the trailhead, a quarter kilometer drive away. A quick introduction and briefing and then we enter the Jeep trail that ferries pilgrims to the temple up on the mountain. About a kilometer and a half later we deviate off the jeep trail and cross a stream to enter into the jungle (Expect leeches in the monsoon and post-monsoon seasons). The trails from here on are not very clear and it is easy to lose our way if we don't remain in one group. This stretch is about 2 kilometers long and passes through thick jungle. The trail eventually opens out to an open field with a couple of huts and agricultural land (the last signs of civilization until we hit the peak). We go past this village dwelling and re-enter the jungle to hear the sounds of the Hidlumane falls. This trail is extremely slippery with sharp rock and winds upwards towards the waterfall. Twenty minutes of scrambling and stumbling up the path and you are at the falls. After a refreshing dip in the falls, we rejoin the jungle trail to the right. The trail here on is extremely steep (60 degrees at certain points) and passes through thick rainforest. 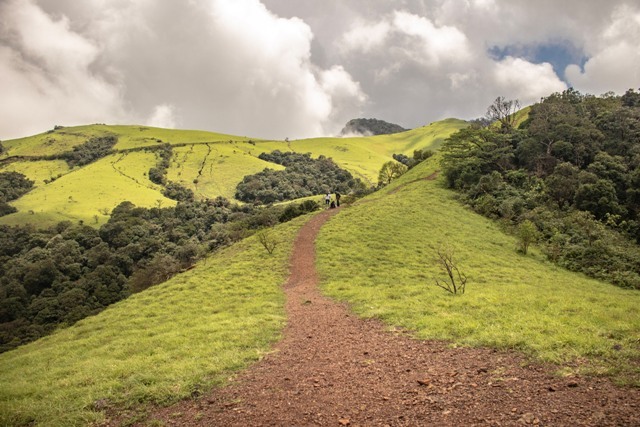 You will be climbing up rocks and branches at certain parts until half an hour later the trail leads out to the hilly grasslands of Kodachadri. 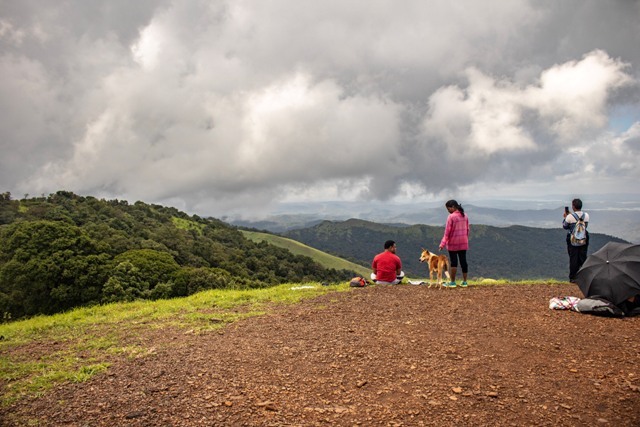 Here on, the trail overlooks panoramic views and winds up and over a couple of hills. About 45 minutes later, the trail merges with the jeep trail. 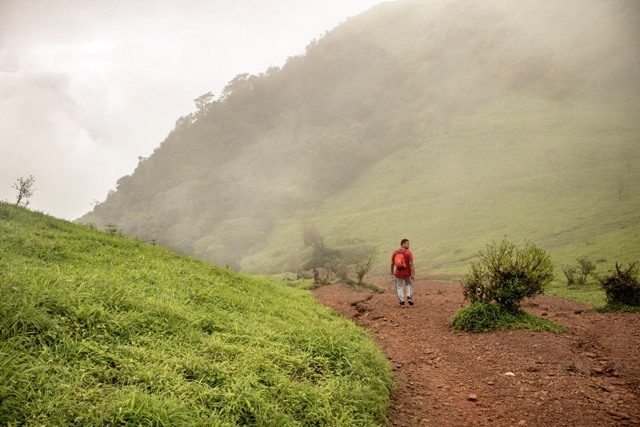 We regroup here and proceed to Kodachadri peak which is a 5 minute walk away from there. We will rest and have our packed lunch on the peak, after which we start heading back to the base. Being easier on the knees and easy to navigate when we begin losing light in the evening, the Jeep trail is ideal for reaching back to the base. A 3 hour hike along the trail and we are back to the base camp for a well deserved dinner and sleep. We freshen-up, have breakfast and leave our base-camp by 8 AM and proceed to the Bidanur fort built by Shivappa Naik 30 kilometers away. The fort belonged to the Keladi dynasty of 17th century and gives a complete view of the landscape in all directions. We will spend an hour here and then proceed towards Bangalore only stopping for lunch (self-sponsored) at Shimoga. 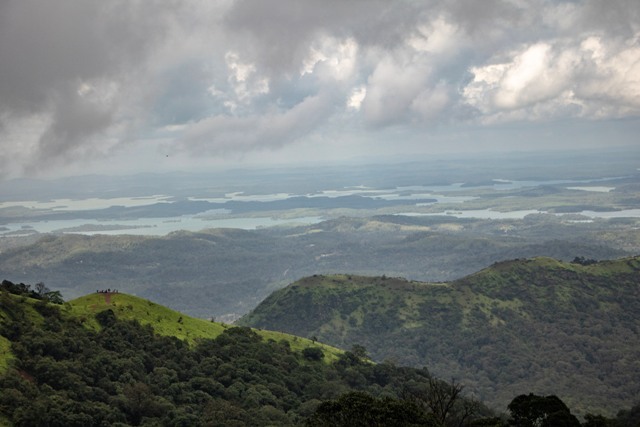 With its beautiful views and evergreen jungle trails, Shimoga makes for a great introductory western-ghat trek. Washrooms Only toilets, difficult to get shower/hot water etc. Transport Non A/c. Depending on number of participants it can be Tavera/Qualis, Tempo Traveler, Minibus, Bus, others. - Trek down to Base camp after sunset. 05:30 AM Wake up - Freshen-up - Breakfast. 09:00 AM Pack your bag & proceed to visit Shivappanaika's Fort at Nagara. 11:00 AM Reach the Fort. 12:00 PM Start back to Bangalore - Have self sponsored lunch on the way.